on page number at left. 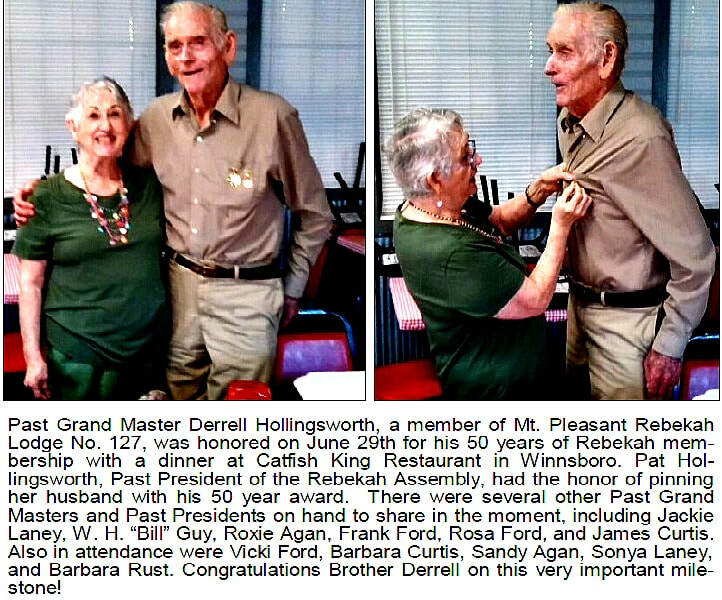 Derrell Hollingsworth, age 84 of Winnsboro, passed away Monday, December 18th, 2017 in Winnsboro. 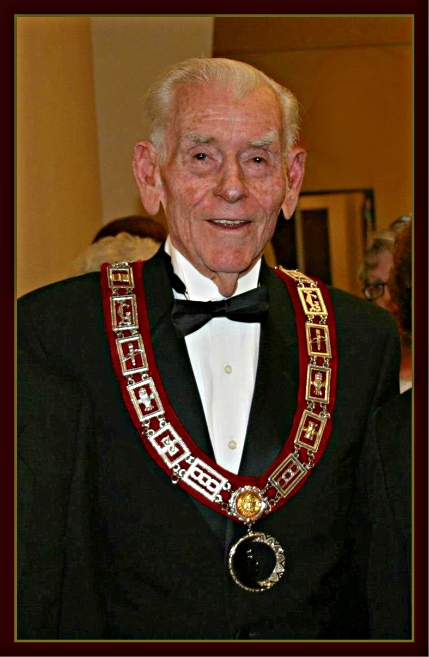 He was born September 13th, 1933 in Winnsboro to Joe T. Hollingsworth and Ina Emily Reid Hollingsworth. Derrell and Patricia married at Walnut Street Baptist Church in Winnsboro on August 20, 1979. He worked as a Tool Pusher in the Oil Fields, retiring after 48 years and affiliations with O.E. Vick, Brooks, Hunt Oil, and Keys Energies and Well Service. 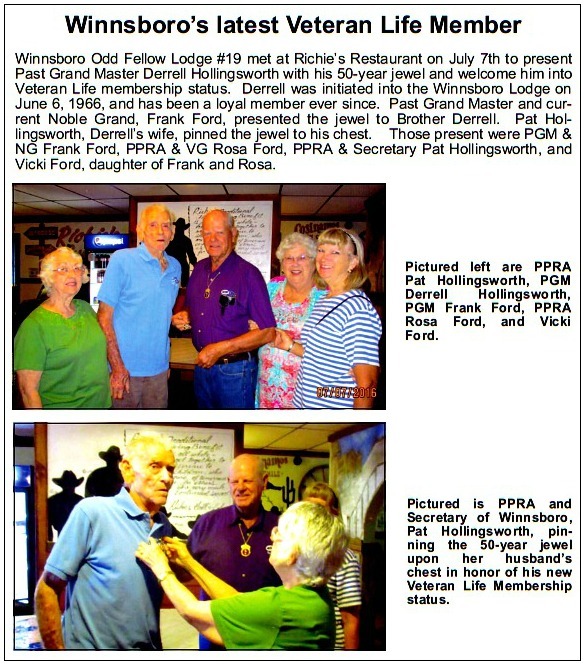 Derrell was a member of Sharon Baptist Church, ﻿Winnsboro Odd Fellow Lodge #19﻿ for 51 years, Winnsboro Rebekah Lodge #71 and Mt. 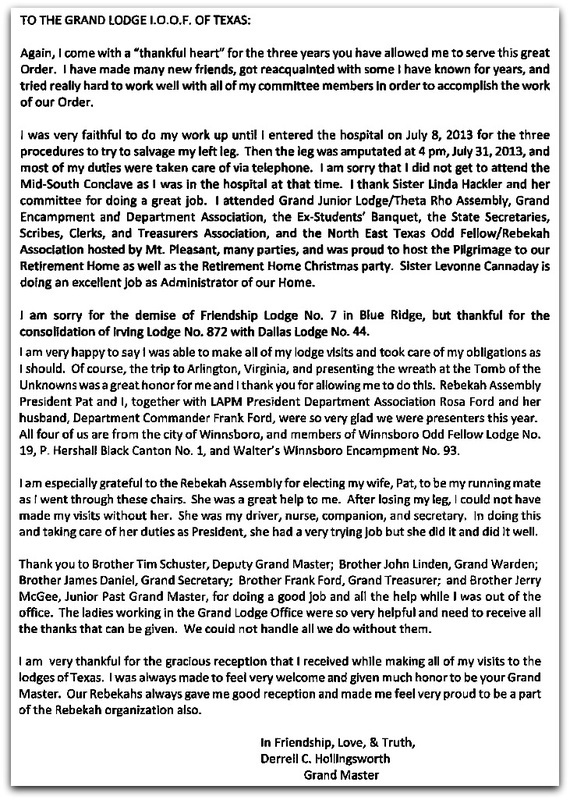 Pleasant Rebekah Lodge #127 for a total of 50 years, Past Grand Patriarch of the Grand Encampment of Texas, with membership in Walters Winnsboro Encampment #93, and Hershal Black Canton #1. 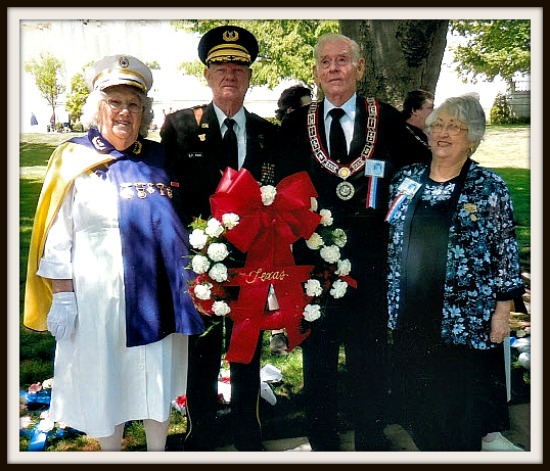 Derrell and Pat were honored by the Grand Lodge of Texas and Rebekah Assembly of Texas to be the first married couple in the history of Odd fellows of Texas to serve together as Grand Master and President of Rebekah Assembly of Texas. Mr. Hollingsworth also enjoyed owning his model A cars, having sold them just a few years ago. He was a member of the Winnsboro Autumn Trails A’s. 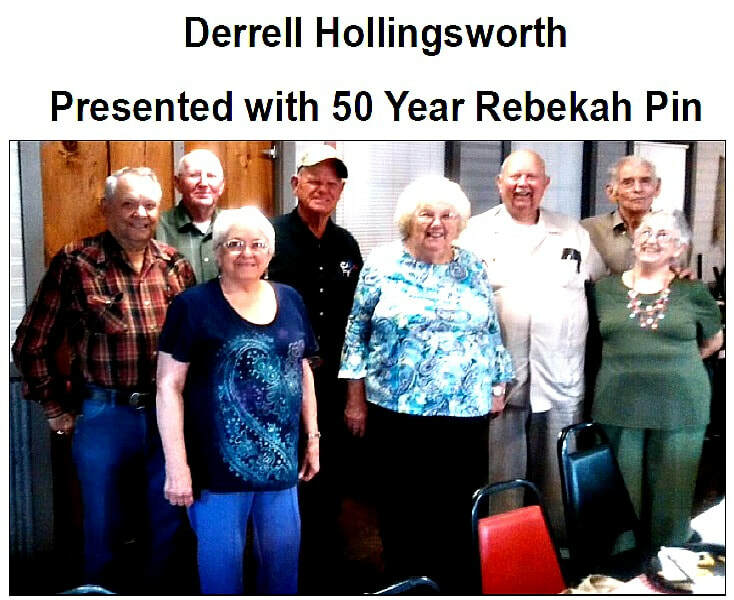 He was preceded in death by his parents; brother Felton Ray and sister-in-law Bobbie Hollingsworth. He is survived by, Wife, Pat Hollingsworth; step-sons, Clifford Alan Plant of Victoria, TX; Donald and Helen Plant of Gilmer, TX; daughter and son-in-law, Sandra and James Tucker of Lone Oak, TX; treasured friend, Brenda and her husband Dwayne Perkins, Grandchildren and spouses, Sharon and Matt Petty, Clint Gilchrest, and Carrie Jo and Steven Crutchfield, six great grandchildren, eight step grandchildren, and seventeen step great grandchildren. Visitation was held Thursday, December 21st, 2017, from 1:00 pm to 2:00 pm at Beaty Funeral Home-Winnsboro, 816 W. Broadway Winnsboro, TX 75494. Funeral Services followed at 2:00 pm, Rev. Willie Beasley officiating. 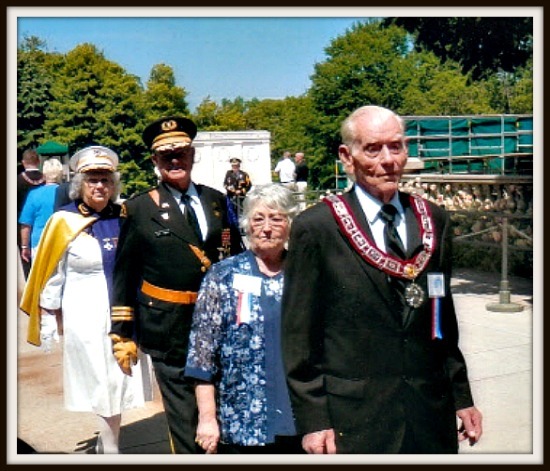 There was an Odd Fellow ceremony at the funeral after the service. A private interment followed at Shady Grove Cemetery in Winnsboro. Click the YouTube arrow below to view the funeral service.